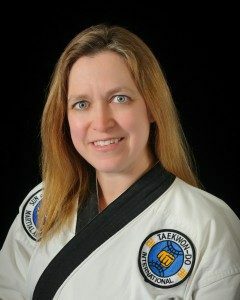 MASTER AMY DEXTER is a 4th Degree Black Belt in Traditional Tae Kwon Do having begun her practice in the spring of 2008. One of Asheville Sun Soo’s early students, Master Dexter holds the distinction of being the first to have been promoted by Master Morris more than one belt during her color belt ranks due to her remarkably accelerated rate of improvement. Recognized early on as having an infectiously positive demeanor, extremely high work ethic and capability as a technician, in 2009 Master Dexter was invited by Master Morris to join the Asheville Sun Soo staff part-time as both an administrative assistant and an assistant instructor. In 2011, Master Dexter was appointed as Director of the Mighty Tigers program (ages 3-5). Accomplished in her excellence as a practitioner, talent as a teacher and dedication to her fellow students, Master Dexter has been a full-time staff member since the summer of 2013. Master Dexter continues training with Master Morris three times per week. She has complemented her Tae Kwon Do practice with training in Hapkido and Jiujitsu, which fortifies her martial arts knowledge and skills, while supporting her instruction to her students. As a practitioner, Master Dexter is recognized for her precision and intensity, inspiring students to overcome their limitations. As a teacher and mentor, Master Dexter is appreciated for her excellent technique, her positive, can-do attitude, and her constant encouragement of students. Master Dexter’s role as full-time instructor is supported by her wide range of experiences in life both personally and professionally. She is a mother, friend to many, long-time athlete, and professional educator. Her professional education includes a B.S. in Elementary and Special Education. Her athletic career includes playing basketball and softball at the university level. Master Dexter’s professional career includes several years as an elementary school teacher in the Buncombe County School System and a former member of the Council for Exceptional Children. Master Dexter, along with Master Morris and Master Dickinson, maintains a prominent presence in all of the 40+ classes per week at Asheville Sun Soo.